Andruw Rudolf Jones (Papiamento pronunciation: [ˈandruw ˈdʒonz]; born April 23, 1977) is a Curaçaoan professional baseball outfielder and designated hitter. He played in Major League Baseball (MLB) most notably for the Atlanta Braves. Jones also played for the Los Angeles Dodgers, Texas Rangers, Chicago White Sox, and New York Yankees, and in Nippon Professional Baseball (NPB) for the Tohoku Rakuten Golden Eagles. Jones was a noted defensive specialist for most of his career and won the Rawlings Gold Glove Award for outfielders every year from 1998 through 2007. Jones also had an elite arm in addition to fielding. He appeared in the All-Star Game five times, and he won both the Hank Aaron Award and a Silver Slugger Award for outfielders in 2005. In 2002, he was the inaugural National League (NL) All-Star Final Vote winner. While primarily a center fielder throughout his career, Jones transitioned to designated hitter and fourth outfielder role for the Rangers, White Sox, and Yankees. Jones made his debut during the 1996 season with the Atlanta Braves. In the 1996 World Series, Jones became the youngest player ever to hit a home run in the postseason, and just the second player ever to homer in his first two World Series at bats. The following season, Jones batted .231 with 18 home runs and finished 5th in voting for Rookie of the Year. In 1998, Jones batted .271 with 31 home runs. In 1999, he batted .275 with 26 home runs, 84 RBIs. Jones batted .303 with 36 home runs and 104 runs batted in (RBIs) in 2000, making his first All-Star team. Jones started to draw many comparisons to Willie Mays and was considered the best center fielder in baseball outside of Ken Griffey Jr. The following season, Jones again blasted over 30 home runs and drove in 104 runs but his average dipped to .251 while his strikeouts increased. Jones played better in 2002 and 2003 and made the All-Star team in both seasons. However, Jones struggled in 2004 and failed to hit at least 30 home runs for the first time since 1999. His strikeouts begun to exceed 100 regularly. However, in 2005, he led the league with 51 home runs and also led the NL with 128 RBIs. He finished 2nd to Albert Pujols for National League MVP. Critics argued his batting average being low was the main reason he finished 2nd. His average continued to dip and strikeouts raised. In 2006, Jones batted .262 with 41 home runs and 129 RBI. In 2007, in his last season with the Braves, Jones had the worst season of his career. He batted just .222 with 26 home runs and 94 RBIs. Having gained weight and alleged as being lazy, friction emerged on Jones and his future status with Atlanta. During his time with Atlanta, Jones became one of the youngest in MLB history to reach 300 home runs. After the 2007 season, Jones signed with the Los Angeles Dodgers as a free agent to a 2-year deal, worth $36.2 million. However, Jones struggled with the Dodgers, batting just .158 with 3 home runs and 14 RBIs. Shortly after the season, Jones was released by the Dodgers. Since then, Jones has played for the Texas Rangers, Chicago White Sox, and New York Yankees. While with the White Sox, Jones belted his 400th career home run. Jones was born on April 23, 1977 in the capital city of Willemstad on the Caribbean island nation of Curaçao. By the age of 11, Jones was on a youth select team that traveled all the way to Japan to play in a tournament. He could handle any position on the field, but because of his powerful arm, Jones often found himself at catcher or third base. He switched to the outfield a couple of years later. Stories of Andruw's early accomplishments are the stuff of legend. As a 13-year-old, playing for his father's Royal Scorpions team, he sent a ball screaming over 400 feet to the tennis court of a nearby hotel. In the same game, Andruw came up again and hit the hotel. By his early teens, he was competing against adults. He even played on Curaçao's national team in the Latin American Games. By the time Andruw turned 15, he was the best player on the island. He had yet to be discovered, however, for Curaçao was still well off the beaten path for major league scouts—even though countryman Hensley Meulens had done well in the New York Yankee farm system. Jones signed with the Atlanta Braves organization as a free agent in 1993 at the age of 16. Jones would be promoted to Danville of the Appalachian League after only 27 games with the Braves farm team in West Palm Beach, Florida. Jones would play for Class-A Macon in 1995. In his first at bat, he belted a homer. He would finish the season with 25 home runs and 100 runs batted in. Jones also led the South Atlantic League with 56 steals. His outstanding season was capped off when he was named Minor League Player of the Year. The Braves brought Jones up to Atlanta on August 15, 1996, when he was just 19 years old. In his first career Major League game, Jones went 1 for 5 with a run batted in and a runs scored. In his second game, he went 2 for 5 with a home run and a triple. He had his first multi-homer game against the Reds on August 22. He spent his early time in the majors playing in right field because established center fielders Marquis Grissom and Kenny Lofton were already entrenched in the position. He would finish the season batting .217 with 5 home runs and 13 RBIs. In the National League Championship Series against the Cardinals, Jones batted .222 with a home run and 3 RBIs. The Braves would win the Series and advance to the World Series. In Game 1 of the 1996 World Series on October 20, 1996, Jones was able to demonstrate his talents on the national stage. He connected for two home runs to left field on his first two at bats as the Braves routed the New York Yankees 12–1. Jones became the youngest player ever to homer in the World Series at the age of 19 years, 180 days, breaking Mickey Mantle's record of 20 years, 362 days – on what would have been Mantle's 65th birthday. Jones joined Gene Tenace as the only other player to hit home runs in his first two World Series at bats. Tenace did it in 1972 with the Oakland Athletics. Jones was selected to the Braves' post-season roster in 1996. During the 1996 World Series he became the youngest player in history to hit a home run in the World Series at the age of 19. Jones became the Braves' everyday right fielder in 1997. Jones hit his first home run of the season against Jeff McCurry of the Rockies. Jones had his first multi-homer game against the Cubs on July 22. On August 31, Jones went 3 for 3 with a home run and 5 runs batted in a game against the Boston Red Sox. Jones finished his rookie season with a .231 batting average, 18 home runs, and 70 runs batted in. Jones also showed his speed by stealing 20 bases. He finished 5th in Rookie of the Year voting. In 1998, he moved to center field nearly full-time, and had a much more encouraging season. His average improved to .271, he hit 31 homers, and stole 27 bases. He hit his 30th home run of the season against Florida on September 13. He also won his first of ten straight Gold Glove Awards. In the 1998 National League Division Series, Jones went 0 for 9 but did draw 3 walks. The Braves would win the series against the Cubs. In the 1998 NLCS against the San Diego Padres, Jones batted .273 with a home run and 2 RBIs. However, The Braves would lose the series in 6 games. Whether he was in the batter's box or gliding under a fly ball to make an easy basket catch, Jones played the game in a very relaxed manner. This temporarily earned him the ire of manager Bobby Cox in June 1998 in an incident in which Cox pulled Jones out of a game, in the midst of an inning, because he felt Jones had lazily allowed a single to drop in center field. Jones would go on to hit .271 with 31 home runs and 90 runs batted in. Jones would also steal 27 bases. Still just 22 years old, Jones had similar numbers in 1999, and though he was a dependable (he played all 162 games that season) and a good player, many began to wonder if or when he would live up to the potential that they believed he possessed. He had a moderate-breakout season with his bat in 2000 with career highs up until that point in batting average (.303), home runs (36), and RBIs (104). He also earned his first All-Star Game appearance. He would also led the National League in Plate Appearances (729) and At Bats (656). Jones would struggle in the National League Division Series against the Cardinals. He would go 1 for 9 with a home run. The Braves would lose the series. However, in 2001, Jones' batting average fell and his strikeouts went up. Jones finished with 34 home runs and 104 RBIs but his average dropped to only .251 and he struck out 142 times. By now, Jones had gained nearly 30 pounds since arriving at the Major Leagues, greatly diminishing his speed on the basepaths (he would not steal more than 11 bases after 2001). He maintained a similar batting performance in 2002, but was still playing superb defense. He would hit 35 home runs and 94 RBIs. Jones would have some great games in September. On September 7, he belted 2 home runs in his last 2 at-bats. In his first 2 at-bats on September 10, he belted 2 more home runs. He became the 11th player in history to homer in 4 straight at-bats. Then on September 25, Jones belted 3 home runs against the Phillies. Jones became the first Braves player to hit 3 home runs in a game since Jeff Blauser did it in 1992. Jones was named to his second All Star team. In 2003, with the power-hitting Gary Sheffield in the line-up, Jones achieved a new career high-water mark in RBIs, with 116. Jones would make his third All Star team and later homer in the game. The American League would beat the National League, 7–6. Unfortunately, he took a step backward in 2004 when he hit fewer than 30 homers and struck out 147 times. During the season, Jones was the subject of trade rumors. Andruw Jones at bat in 2006. Prior to the 2005 season, Jones increased his workout regimen and, following advice given by Willie Mays, widened his batting stance. The result was his most productive offensive season ever. After Chipper Jones went down with an injury early in 2005, Jones would carry the Braves. By the All Star break, Jones was leading the National League in home runs with 27. Jones was named to the All Star team, the fourth of his career. Jones would hit his 40th home run of the season on August 23 in a loss against the Cubs. It marked the first time in his career that he hit at least 40 home runs in a season. Jones became the first Braves hitter to hit 40 home runs in a season since Javy Lopez did it in 2003. On September 14, 2005, Jones hit his 300th career home run which went 430 feet (130 m) off Philadelphia Phillies reliever Geoff Geary in a 12–4 Phillies win. The ball landed in the upper deck in left field at Citizens Bank Park. Jones became the first hitter since Alex Rodriguez (57) and Jim Thome (52) to hit at least 50 home runs in a season. Jones also became the 12th player in history to hit 300 home runs before his 30th birthday. Jones hit a major league-leading 51 home runs, surpassing Hank Aaron's and Eddie Mathews' single-season club record, and winning the Babe Ruth Home Run Award. He also led the National League with a career-high 128 RBI. Jones' torrid hitting in the summer, especially while teammate Chipper Jones was out with an injury, helped carry the Braves to their 14th consecutive division championship. He finished just behind St. Louis Cardinals' first baseman Albert Pujols in the 2005 NL MVP vote. In the 2005 National League Divisional Series against the Houston Astros, Jones hit .471 with a home run and 5 RBIs. However, the Astros would take the series, 3–1. Before the 2006 season, Jones played in the World Baseball Classic for the Netherlands. Jones started the season by hitting a home run off a pitch from Derek Lowe. Jones finished the game by going 2 for 4 with a home run, 4 runs batted in, a strikeout, and a base on balls. The Braves won the game, 11–10. From April 16 through April 19, Jones homered in 4 consecutive games. During that stretch, he batted .438 with 5 home runs and 8 runs batted in. Jones finished the month of April with a .281 average, 8 home runs and 23 runs batted in (RBI). Jones would match his career high with 6 runs batted in on July 18 against the Cardinals. He also went 5 for 5 with 2 home runs. On August 29, in a game against the Giants, Jones drove in 3 runs, which gave him his 1000th career RBI. On September 26, in a game against the New York Mets, Jones hit his 40th home run of the season. He became the first hitter in Atlanta's history to have consecutive seasons of at least 40 homers. Jones finished the 2006 season with 41 home runs and 129 RBIs. Jones also became more selective at the plate (82 walks, as compared to 64 the prior season), which helped him score 107 runs during 2006, an increase of 12 over the prior year and his most in a single season since 2000. He won his ninth consecutive Gold Glove award. The Braves would go on to finish with a 79–83 record and missed the postseason for the first time since 1990. Coming into the last year of his contract with the Braves, many fans and sports analysts alike felt that 2007 would be the last year in which Jones would be a Brave, mostly because of his potential value on the market that the Braves would not be able to afford. Jones, however, had an unexpectedly poor start to the season, striking out 51 times in 41 games and carrying a batting average in the low .200s for the majority of April and May. On April 30, Jones hit a three-run walk-off home run against the Philadelphia Phillies. On May 28, Jones hit his 350th career homer off Chris Capuano. After the All-Star break, Jones continued to have productive power numbers; however, his batting average remained poor. He was honored with a Fielding Bible Award as the best fielding center fielder in MLB. Jones finished the 2007 season with 26 home runs and 94 RBIs. On the downside, Jones hit only .222 and struck out a career high 138 times. On October 2, the Braves announced they would not be bringing Jones back for the 2008 season. Jones (25) with White Sox first baseman Paul Konerko during spring training action, 2008. On December 5, 2007, Jones agreed to a two-year deal with the Los Angeles Dodgers, worth $36.2 million. After showing up out of shape and over 20 pounds overweight, he continued to struggle, hitting below .200 for most of the season. Additionally, he had only 10 hits in 116 at-bats with runners in scoring position. Due to his lack of production, Jones was dropped to eighth in the Dodger line-up. This was the first time since 1998 that Jones had hit eighth in any line-up. Jones was put on the disabled list for the first time in his entire career on May 25, 2008. He had knee surgery after injuring his knee during batting practice earlier that day. On July 27, 2008, the Dodgers manager Joe Torre benched Jones and said that he would only be used as a spot starter in the future. At that time, Jones had a .166 batting average, two home runs and 12 RBIs combined with an incredible 68 strikeouts in 187 at-bats. On September 13, 2008, Jones was put on the 60-day disabled list, putting an end to his very disappointing season with the Dodgers. Jones finished the season with a .158 batting average, just three home runs, and 14 RBI. He was not seen in the dugout during any of the postseason games, nor the celebrations in the locker rooms, since he had been removed from the playoff roster and sent home for the winter. Jones stated that he did not wish to return to the Dodgers in 2009, saying that the Los Angeles fans did not give him a fair chance. During the 2009 off-season, the Dodgers reached an agreement with Jones to trade or release him before spring training in exchange for a deferral of some of the remaining money due on his contract. On January 15, 2009, Jones was officially released by the Dodgers. On February 8, 2009, Jones signed a one-year minor league contract with the Texas Rangers; the deal paid him $500,000 for making the major league team, and offered $1 million in incentives. Jones reportedly turned down a similar offer from the New York Yankees to compete for their center field job and expressed an interest in staying with the Rangers even though he would likely not be a starter. He earned the Rangers' final roster spot. He was originally intended to be a pinch-hitter for the Rangers, but found a starting outfield role due to an injury to Josh Hamilton. Jones would go 3 for 5 in his Rangers debut with a RBI and 2 runs scored. In his next game, Jones went 2 for 3 and scored 2 runs. He also hit his first home run as a member of the Rangers in the seventh inning off of Danys Báez. By the end of April, Jones was batting .344 with 3 home runs and 6 runs batted in. Jones was also faced with an opportunity to play against his old club, the Dodgers. Jones would play 2 games against them on June 13 and 14, homering in each game. On July 4, Jones went 2 for 5 with a home run and 4 runs batted in against the Rays. On July 8, in a game against the Angels, Jones hit 3 home runs and drove in 4 runs in an 8-1 win. It was his second career 3-homer game. Jones had a chance to hit his fourth home run of the game in his final 2 at-bats, but he popped out and struck out. "I was thinking about it. I tried. I just didn’t get it done," Jones said. "I’m just happy we won." Jones ultimately hit only .214 for the season, but did have 17 home runs in 82 games. On November 25, 2009, Jones signed a $500,000 deal for 2010 with up to an additional $1 million in performance bonuses. Unlike what he had done with the Braves and Dodgers in previous seasons, Jones showed up to camp in shape, a full 30 pounds under his previous weight. On April 23, 2010, Jones hit two home runs on his 33rd birthday, including a walk-off to help the White Sox win 7–6 over the Seattle Mariners. On July 11, he hit his 400th career home run. He finished the year with nineteen home runs in 278 at-bats. He scored 41 runs, had 48 RBI and 64 base hits in 107 games, the most games he has appeared in since 2007. On January 20, 2011, Jones and the New York Yankees agreed to a contract for the 2011 season for $2 million, with an additional $1.2 million in performance bonuses. In his first Yankees at-bat on April 5, 2011, Jones hit a home run over the left field wall at Yankee Stadium off the Minnesota Twins' Brian Duensing. Jones finished the season with a .247 average, 13 home runs and 33 runs batted in. He became a free agent after the World Series. Jones re-signed with the Yankees for the 2012 season on December 30, 2011. The deal is a one-year deal worth $2 million. He was slated to be a backup. However, due to Brett Gardner's DL stint, Jones received more starts than anticipated. Jones played very well in the first half of the season hitting 12 home runs in his first 62 games, including three over the course of a double header in Boston, but in August and September he hit only .139 with two home runs over his final 32 games. On December 7, 2012, Jones agreed to a one-year ¥300 million (approximately US$3.5 million) contract with the Tohoku Rakuten Golden Eagles of Japan's Pacific League. He finished the regular season with 26 home runs in 478 at-bats. He scored 81 runs, had 94 RBI, 116 base hits and 105 walks in 143 games, helping Eagles to clinch their first Pacific League Championship. 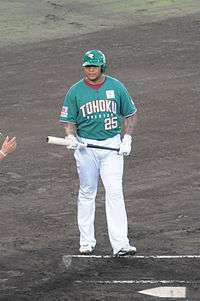 His steady performance would continue in post-season, including two home runs in the 2013 Pacific League Climax Series and one in the 2013 Japan Series respectively, which played a key role in the Eagles' Japan Series win. After the season, Jones re-signed with Rakuten for the 2014 season, agreeing to a one-year contract worth ¥400 million (approximately US$3.8 million). In his two years with Rakuten, Jones hit 50 home runs and played primarily at designated hitter, however he played 48 games at first base, far more than the eight he played in his career before coming to Japan. Since playing in Japan, Jones attempted comebacks in both the 2015 and 2016 MLB seasons. He officially retired from baseball in February 2016 and was hired by the Braves as a special assistant later that month. As at end of the 2012 season, Jones owned a career .254 average, with 434 home runs, and 1,289 runs batted in. He currently ranks at 40 on the career home run list. However, Jones' weakness has been hitting against the breaking ball and hitting for good average. Only once in his career has Jones batted .300 or better (he batted .303 in 2000), and since 2007 – the year he turned 30 – he has hit just .214. Jones was also known for his speed early in his career. In fact, his speed earned him the last playoff spot on the Braves' roster in 1996. Jones stole 20+ bases from 1997 to 2000. However, his speed declined as he hit for more power. Jones has not stolen at least 10 bases since he stole 11 in 2001. This could also be contributed to a noticeable weight gain with Jones. Also, since 2000 due to his power numbers going up, he has been almost trained to hit only fastballs. Jones also owned the lowest batting average (since broken by Jose Bautista in 2010), slugging percentage, on-base percentage, and runs scored in a season for a hitter that belted 50+ home runs in a season. Jones hit 51 in 2005 but batted just .263, with a .575 slugging, .347 on base, and 95 runs scored. From 1998 to 2007, Jones won 10 consecutive Gold Gloves. His 10 Gold Gloves for an outfielder ranks him in a tie for second with Al Kaline, Ichiro Suzuki, and Ken Griffey Jr. for most Gold Gloves won by an outfielder. Jones is also one of five center fielders to record at least 400 putouts in a season six times. The others are Willie Mays, Richie Ashburn, Kirby Puckett, and Max Carey. 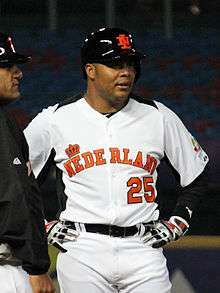 Being born in Curaçao allowed Jones to be eligible for the Netherlands national baseball team during their participation in the inaugural World Baseball Classic in 2006. Jones would later join the team again for the 2013 World Baseball Classic. Two years later, in 2015, Jones was selected to play with the National Dutch team as a first baseman for the 2015 Premier 12. He later announced that those were his final games as a player. Jones is married to Nicole Derick. They are the parents of one son, Druw, and one daughter, Madison. He has one daughter, Andrianna, with April Caraway. Early on the morning of Christmas Day, 2012, Jones was arrested for battery after police officers responded to a domestic disturbance call between him and his wife Nicole in suburban Atlanta. He was released on $2,400 bond late that morning. Nicole Jones filed for divorce in early January 2013 and the two went to court over custody of their son. ↑ "Andruw Jones: making a name for himself with the Atlanta Braves: center fielder helped Atlanta position itself in another run at a N.L. Eastern Division title". Findarticles.com. Retrieved December 8, 2012. ↑ Foltman, Bob (June 29, 2004). "Reed's exit credit to outfield depth". Chicago Tribune. Retrieved March 2, 2016. ↑ Edes, Gordon (July 28, 2004). "For now, rumors all talk". Boston Globe. Retrieved March 2, 2016. ↑ "Jones Puts Mays' Advice To Good Use". Orlando Sentinel. March 29, 2005. Retrieved March 2, 2016. ↑ "September 14, 2005 Atlanta Braves at Philadelphia Phillies Box Score and Play by Play". Baseball-Reference.com. Retrieved April 1, 2009. ↑ Bowman, Mark (September 14, 2005). "Andruw hits two milestones with homer; Braves center fielder belts No. 50 of 2005, No. 300 of career". MLB.com. Retrieved April 1, 2009. ↑ "Braves announce they won't try to re-sign Andruw Jones". USA Today. Associated Press. October 2, 2007. Retrieved May 22, 2011. ↑ "Dodgers' Jones out 4-6 weeks after going on DL for first time in career – MLB – ESPN". Sports.espn.go.com. May 25, 2008. Retrieved December 8, 2012. ↑ Farley, Mike (August 23, 2008). "Top 10 Active MLB Windmills". Scoresreport.com. Retrieved December 8, 2012. 1 2 3 "Andruw Jones Statistics and History". Baseball-Reference.com. Retrieved December 8, 2012. ↑ Gurnick, Ken (September 13, 2008). "Jones placed on DL; Saito activated". MLB.com. Archived from the original on September 18, 2008. Retrieved September 14, 2008. ↑ Dodgers Release Andruw Jones Archived January 22, 2009, at the Wayback Machine. ↑ "Rangers ink Andruw to Minors deal". Texas.rangers.mlb.com. Retrieved December 8, 2012. ↑ "Rangers, Jones agree to deal". Sports.espn.go.com. February 8, 2009. Retrieved December 8, 2012. ↑ "Texas vs Angels July 8, 2009". Espn.go.com. July 8, 2009. Retrieved January 8, 2014. ↑ "Royals vs White Sox July 11, 2010". Espn.go.com. July 11, 2010. Retrieved January 8, 2014. ↑ "Yankees reach deal with Jones". CNN. January 20, 2011. ↑ "Andruw Jones 2012 Batting Gamelogs". Baseball-Reference.com. Retrieved August 11, 2015. ↑ "Veteran outfielder Andruw Jones, who spent two seasons with Yankees, to sign with Japanese team, according to report". Nydailynews.com. October 27, 2012. Retrieved December 8, 2012. ↑ "Andruw Jones, formerly of New York Yankees, set to sign with Rakuten Eagles – ESPN". Espn.go.com. December 11, 2012. Retrieved January 8, 2014. ↑ "Nikkan Sports: Rakuten Agrees with Andruw Jones". NPB Tracker. December 7, 2012. Retrieved January 8, 2014. ↑ "楽天 元ソフトＢファルケンボーグ獲得 – プロ野球ニュース". nikkansports.com. Retrieved January 8, 2014. ↑ "Andruw Jones looking to return to MLB after two years in Japan". ESPN.com. Retrieved August 11, 2015. ↑ "Andruw Jones hoping for MLB comeback in 2016". Yes Network. Retrieved August 11, 2015. ↑ O'Brien, David (February 24, 2016). "Andruw Jones makes it official: He's retired". Atlanta Journal Constitution. Retrieved March 2, 2016. ↑ Bowman, Mark (February 29, 2016). "Braves hire Andruw as special assistant to baseball ops". MLB.com. Retrieved March 2, 2016. Wikimedia Commons has media related to Andruw Jones.